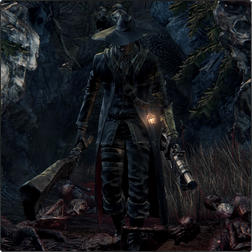 Old Hunters wielding Beast Cutters are the first of this enemy type to be encountered in the Hunter's Nightmare. These powerful opponents will alternate between the weapon's normal and transformed modes, using quick slashes at close range and slower whip attacks at a distance, though they will primarily stick to the transformed state. Their whip swings have wide arcs and considerable delays that can be difficult to anticipate, and they will intersperse their melee attacks with shotgun blasts which can cause flinching if they connect. They will also frequently quickstep backward to dodge attacks and establish enough distance to use their whips effectively. 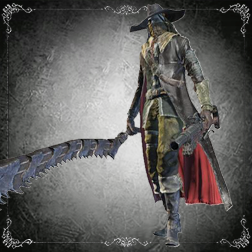 While their high health and attack power make them especially dangerous to players accessing the Hunter's Nightmare early in the game, they represent a real threat even to full-fledged hunters and should always be approached with caution. Be especially careful of the one with red eyes as this version is considerably stronger. The simplest way to deal with these opponents is to stand just outside their melee range, wait for them to inmate one of their slow whip attacks, interrupt it and quickstep forward to perform a visceral attack. It is important to take the delay of their whip swings into consideration when using this strategy, as well as to be prepared for a blunderbuss shot; the incoming blast can be identified by the sound of the gun cocking just before firing and should be dodged by quickstepping forward through it. Charged attacks from heavy weapons such as the transformed Kirkhammer will flatten these hunters, but they will usually back away before the attack finishes charging and are difficult to stagger from behind as a result. The safest opportunities to strike them with melee attacks occur while standing behind them after quickstepping forward through their whip swings; their recovery period leaves enough time for two to three hits before they attack again, depending upon the weapon used. 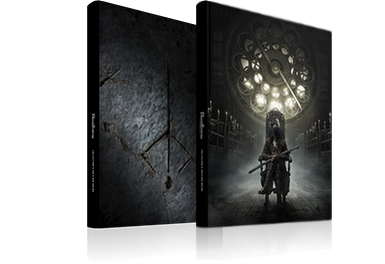 In certain locations they can be ambushed with near-impunity while their attention is focused on the resident Beast Patients.